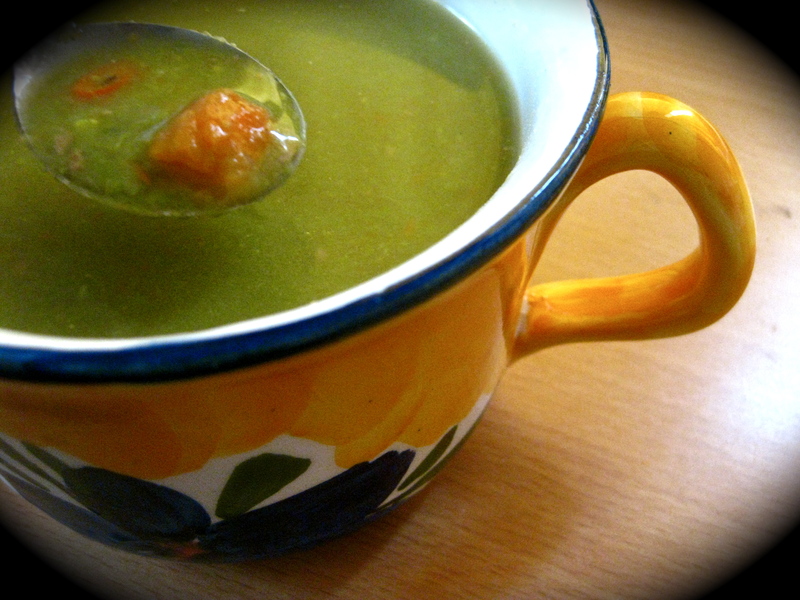 I must admit that for the 6 months I spent in the Netherlands, I never really took to having pea soup a.k.a ‘snert‘. That’s not because I don’t like it, but rather because I don’t really know it and friends are telling me ‘you’ve really got try it in the winter’ instead of ‘you’ve really got to try it now’. Well, specifying an undefined time frame like ‘winter’ (and the weather in the West went bonkers this year) only feeds my huge tendencies of procrastination, and I ended up waiting and waiting and waiting.… until I left the Netherlands, and until the first break of spring. Being Asian, I’m definitely more accustomed to clear soups with loads of chunky ingredients tangled in a network of slick noodles. Western soups never really offered the same oomph factor for me, but since my FST (Food Science and Technology) project group’s soup new food product development company assignment in 2008, I’ve started to be a lot more open about pureed soups. Just to put things into perspective about how Asians like these types of soup, the sensory evaluation conducted on our 13 blended soups (incl. timeless favourites like pumpkin, potato, pea, beet, tomato, etc…) rated an average of 2-4 on a 9-point hedonic scale. A ‘9’ is a ‘like extremely’, a ‘5’ is a neither like nor dislike’ and a ‘1’ is a dislike extremely. The recipe inspiration was from Nigella Lawson’s Cheap Healthy and Good site, but I have made it to suit my own tastes i.e. not too thick, needs some chunks, invisible oil, and spicyyy oh yeahhh. 🙂 Also didn’t have cheese or cream or yoghurt on me… I like to work with the ingredients that I already have. In saucepan, saute the ham with the garlic and onion. The fat from the ham is quite sufficient for me. Sure, you can use any vegetable oil for a vegetarian option! Add water / vegetable stock when no.1 is fragrant. Throw in the bay leaf, carrots, peas and boil till soft (about 10-15min). Scoop out the bay leaf and half of the carrots out (or leave the carrots in), then immersed the blender in the soup and blend till smooth. Add the carrots back in, flavour with chilli, pepper and thyme to taste! Recipe suggestions: I can imagine celery / potato / leeks tasting nice in there, or replace the bay leaf / thyme with some mint / parsley / marjoram / coriander. Take a sniff of whatever you have in the kitchen and have fun experimenting! Do adjust the thickness of the soup by varying the proportion of vegetable stock to peas.